Craftsmanship with attention to detail makes the Collenburg counter height extension table perfect for casual dining. Simply add in the separate leaf for more space at the table. Its rich brown finish and decorative nail head trim adorn this table with beauty. The braced legs, metal accents and lower shelf create a robust look with a hint of industrial style. 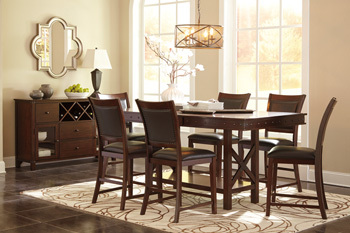 Of all the furniture stores in Pigeon Forge, TN , Ogle Furniture has the best selection of the SIGNATURE ASHLEY-ITEMS: D564-32/124 RECT DINING TABLE & UPH SIDE CHAIRS. This item may also come in various sizes, styles, or colors. Please ask one of our representatives if we have the specific color/style you are looking for.